A small coffee house was built around 1770 with an addition erected in 1792--the City Hotel. The hotel and tavern became the center of Old Alexandria's social life; Washington dined here often and danced in the ballroom. The Tavern was reopened as a museum with a restaurant in the mid-1970s. 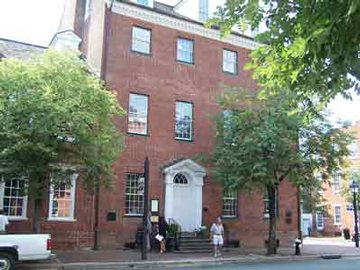 Gadsby's Tavern is located across from the Alexandria City Hall and Market Square on Royal Street. From April 1 through September 30, Gadsby's Tavern is open Tuesday-Saturday from 10 a.m. to 5 p.m. and Sunday from 1 p.m. to 5 p.m. From October 1 through March 31, hours are 11 a.m. to 4 p.m. Tuesday-Saturday and 1 p.m. to 4 p.m. on Sunday.